The popular pastor's oldest son said his late father never considered himself a celebrity: "It was God that did it, and not him." The eldest son of the late pastor Billy Graham described his father as a humble servant who always viewed himself as a North Carolina farm boy and not the towering figure of modern American religion who developed a worldwide following. “God for some reason just touched my father and blessed him, and so the successes, he’d want everybody to know that it was God that did it, and not him,” the Rev. Franklin Graham told TODAY on Thursday in his first live interview since the death of his father. Billy Graham, one of the nation’s most well-known and influential figures in 20th-century religion, died Wednesday at his North Carolina home. He was 99 years old. 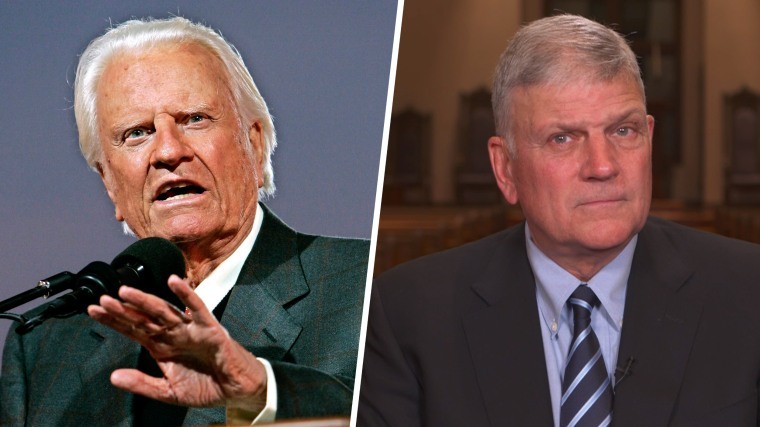 "I kind of chuckled because my father said years ago, 'When you hear that Billy Graham is dead, don't you believe it for a second,'" Franklin Graham said. "He said, 'I'll be more alive than ever before.' He's in the presence of God, so we rejoice and we’re thrilled that his suffering is over." Billy Graham, who was diagnosed with Parkinson’s disease in the 1990s, was confined to a wheelchair and his bed for the last five years, “but his mind was always clear,” his son said. “He never got foggy," he added. "He never got where he didn’t understand. He just couldn’t hear very well, he couldn’t see. But you could communicate with him." Franklin Graham said he spoke to his father on Sunday and that "he was mentally still very much alert." He said that the evangelist who took his popular crusades around the world was the very same person he and his siblings saw at home. Graham said his father would want to be remembered simply by everyone as a preacher. It was a topic that came up more than a decade ago when the family lost Billy Graham's wife, Ruth. “When my mother passed away, we knew what she wanted on her tombstone, so I asked my father, so there wouldn’t be any argument among us children, 'Daddy, what do you want on your tombstone?'" Franklin Graham recalled. "He thought about that. He said, preacher. So that’s what’s going to be on his tombstone. Preacher."